WAIMEA, Hawaiʻi - The pink banners are going up, marking festivities held at various venues sprawling through Waimea's town’s center during the annual Cherry Blossom Heritage Festival. (BIVN) – The 26th anniversary of the Waimea Cherry Blossom Heritage Festival is celebrated today, from 9 a.m. to 3 p.m.
Festivities are at various venues sprawling through the town’s center—look for pink banners identifying site locations. Festival parking is available at Parker Ranch Center, the soccer field across Church Row Park and along Pukalani Street. Festival shuttles offer free transportation among most venues 8:30 a.m.-3:30 p.m. by Roberts Hawaii, though walking is encouraged among venues. A map of the shuttle route and festival venues is available in a detailed festival program available at each venue location on February 2. Organized by members of the upcountry community and the county’s department of parks and recreation, the festival marks the blooming of the historic cherry trees at Church Row Park and celebrates the age-old Japanese tradition of hanami, which translates to “cherry blossom viewing party.” After a seasonal winter chill, the trees typically are blooming in early February. The 2019 event artwork is “Kamuela Hongwanji in Springtime” by Waimea artist Ilmar Reinvald. His oil painting has been reproduced on a limited number of festival collector posters at the Waimea Arts Council’s Firehouse Gallery. The $10 posters will be for sale during the festival. A quick rundown of festival activities at various locations follows (times are 9 a.m.-3 p.m. unless specified otherwise). Schedule is subject to change. Activities are free unless noted. Entertainment: Hula, Japanese dance, taiko drumming, lion dance, judo demo 9:30 a.m.-pau. Keiki Train Rides: The Kohala Mt. Express—a trackless, barrel train for small children offering rides by Engineer Clarence and Conductor Gloria Yee of Hawi. Rides are $3 per child. Asian Collectibles/Food Sales at Kamuela Hongwanji: Browse Asian-themed collectibles including kimonos, cherry blossom crafts, plus Asian foods: Inari sushi, nishime bento, chichi mochi and andagi. Cooking Demos at Kamuela Hongwanji: Hawai‘i Island chefs offer cooking demonstrations with free samples 9 a.m.-noon. Open House at Kamuela Hongwanji: Rev. Bruce Nakamura explains Shin Buddhism rituals. Tea Tasting: Mauna Kea Tea offers samples of locally produced and Japanese teas. Learn how to best prepare and maximize the benefits of these teas; Japanese teas presented by the Japanese Tea Instructor’s Program of Japan. Hawai‘i teas will be for sale. Festival Entertainment Stage: In the back parking lot. Opening 9 a.m., welcome ceremonies kick off continuous entertainment until 3 p.m.: Bon Odori Taiko, Christy Lassiter and Friends, Lion Dancers, Young-at-Heart Line Dancers, Lori Lei’s Hula Studio, Darlene Ahuna, Patio Productions and Tai Shoji Taiko. Craft Fair: Nearly 150 crafters and community booths inside Center and in back parking lot. Performing Arts: On stage: Koto player and teacher Darin Miyashiro at noon. Enjoy a variety of Asian performing arts titled “Sakura Beauty and Spirit” 2-3 p.m., including the Shizuno Nasu Dance Institute from Japan, Buddhist vocalist Chef Priest Koshin Nagamune and Okinawa Kobudo Taiko. Ikebana display in the lobby by Chikako Powers. Ka Hui Kapa Apana O Waimea Quilt Show: Display honoring late quilt club members Emi Wakayama, Leona Wishard and Nancy Phillips; sewing novelties and craft fair. Japanese Collectibles: View a display of vintage kimonos and collection of kokeshi dolls, plus learn about the 1840 Spencer House. KTA Super Stores Waimea: Food sampling, sake tasting, keiki activities, lion dance, balloons and prizes 10 a.m.-1 p.m.
Waimea Center’s Center Court: Kohala Taiko at 9:30 a.m., Majestic Culture and the Arts Assoc. Lion Dance starts 11:45 a.m. at KTA and winds through center, Honoka‘a Jazz Band. Firehouse Gallery Activities: Waimea Arts Council presents cherry blossom and spring-themed art, sales of $10 festival poster and sale of original festival oil painting, sidewalk chalk drawing for all ages, keiki face painting, food sales. Waimea Preservation Association Cottage: Waimea Outdoor Circle gives away heirloom seeds and offers a display of native Hawaiian plants from Waimea Nature Park. Waimea School Gym: Craft fair and farmers market. Thelma Parker Memorial Public and School Library: Create your own cherry blossom trees/branches using paint and other materials, suitable for framing. Materials will be provided and all ages are welcome, 9:30 a.m.-3 p.m.
Japanese Tea Ceremony: The Urasenke Hilo Association performs traditional chanoyu inside Puuopelu starting 9:30 a.m. and every half hour thereafter until 2 p.m.
Interactive Fun: Self-guided tours of Historic Homes; feather lei making demos. 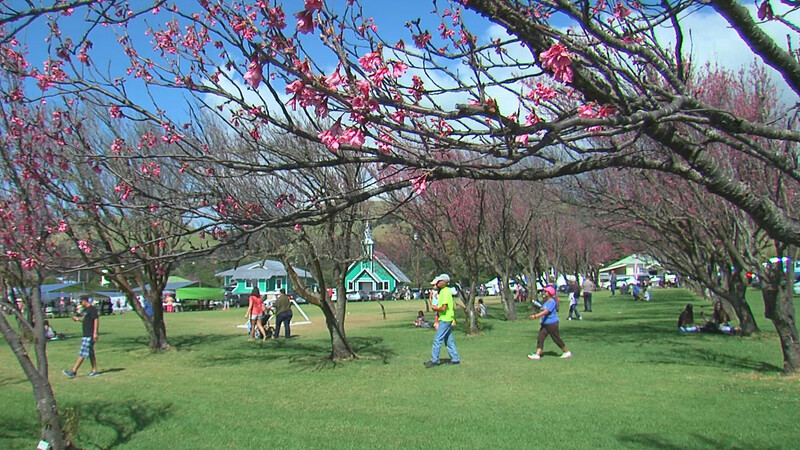 The Waimea Cherry Blossom Heritage Festival is produced by the Hawaii County Parks and Recreation’s Culture and Education Section. The festival is a community-wide effort by a dedicated team of volunteers, 808-961-8706.